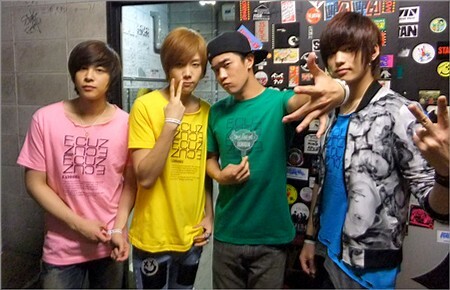 F.cuz, a Korean group made up of Lee U, Jinon, Kan and Ye Jun, is a group of four flower boys with an average height of at least 180cm. They recently held a Mini Live Event in Tokyo Roppongi's Laforet Museum on May 21st. What took the fans by surprise was that towards the end of the event, Lee U suddenly announced that he was going to withdraw from the group, causing the audience to drown in a sea of tears. F.cuz, a group that had only debuted with on January 8th, 2010, which was not too long ago, has already faced the awkwardness of a member's departure. And this has also cause the fans to be in total confusion. During the "Talk" time of the Live Event, the members were playing games under a relaxed, and happy atmosphere. After performing , , and , Leader Jinon and Kan both presented their self-composed solo pieces and . Jinon revealed that the Japanese version of has already been recorded and will be coming out in Japan on August 17th. After singing , all four members exited the stage, and with all the fans screaming for encore, the monitor started player a pre-recorded video by Lee U: “I have something that I want to let everyone know today, and that is...I will be leaving F.cuz. I have found the music that I would like to pursue…. Please continue to love us like you have have always done, please don’t hate the other members for my departure. I had been troubled by this (whether or not to stay in the group or to go solo) for a really long time, and have at last made up my mind. I have also gained the members’ understanding, instead, they encouraged me and cheered me on. I am very sorry....”. Maybe because this came all too suddenly, the audience were in complete silence. There were no responses until after the video was finished, where someone said: “What?! Did I hear that right?". Right after, Lee U started performing ballad solo pieces and . He just couldn’t hold his tears back, causing the fans to start crying with him as well. Jinon, Kan and Ye Jun suddenly appeared on stage, singing along and tried comforting the crying Lee U. Although he put so much effort into holding his tears back, during , Lee U couldn’t help but started sobbing with his head down. Jinon calmly explained to the fans the reason for Lee U’s departure: “We are truly sorry for having to announce this to everyone today. Please don’t be sad, Lee U will still have a chance to perform with us in the future. The times prior to our Japanese CD release in August (F.cuz’s Japanese Single Debut), he will still be with us, and we will still visit Japan. We are very sorry that we won't be able to stay by his side in the future, but I believe that all of you will still continue supporting us, right?” On the side, Lee U, who was in Kan's embrace, was still unsuccessful in holding back his tears. “The memory that we’ve had with Lee U will last a lifetime. Please continue supporting us in the future.” Kan said to the audience. Lee U, who wiped his tears away and attempted to stay calm, took a deep breath and said: “Yes, I won’t cry. I believed I said it a while ago, that all of your smiling faces have been engraved into my memory. All of you may still be in shock right now, but I still wish to see all your smiling faces, because if you cry, we will end up crying too.” Lastly, F.cuz performed the guitar version of , and promised that they will appear again in the future with an even more improved image. F.cuz, who haven’t even made their debut past a year and a half, have made everyone feel awfully sympathetic for the fact that they already have to face a member's departure. For many, however, being the son of Korea's famous trot singer Sul Woon Do, and gifted with a decent vocal and appearance, Lee U ending up going solo may be something that was within expectations”. Their management company “Can Entertainment” have also made their official announcement on Lee U’s departure on the 20th of May. With what new concepts will they have from now? And how will Lee U do after going solo? Let us all anticipate for further updates. Tu m'aas pris de vitesse, je voulais la mettre. J'espère que cette scène n'a pas été filmé ou du moins que je la verrais pas ... Sinon je suis sûre que mon moral finira plus bas que terre.